Use the KODAK 8000 System to deliver clear, easy-to-diagnose digital panoramic images. From TMJ to maxillary sinus images, the intuitive digital panoramic x-ray generates the high-quality images you need to make accurate diagnoses on the spot—no waiting required. Simply put, it’s one of the easiest and most affordable panoramic imaging systems available. Extend the diagnostic capabilities of your KODAK 8000 System with our digital cephalometric option. The epitome of simplicity, the new and improved version of the KODAK 8000 System delivers clear, optimally exposed panoramic images in seconds. Providing immediate access to your extra oral images, the system lets you make accurate diagnoses on the spot, so you can easily communicate treatment options to your patients. Recommended for standard dental exams, implant evaluations and oral surgeries such as extraction plannings, crown-to-root evaluations and TMJ evaluations. The KODAK 8000 System makes it easy to capture crystal-clear panoramic, TMJ, segmented panoramic and maxillary sinus images—with no waiting required. Capture extra oral images in just over a second and expose them in a single shot with the digital x-ray that provides clear, optimally exposed panoramic images in the blink of an eye. Powered by a high-frequency generator, the KODAK 8000 System ensures radiation remains constant during the exposure. So you receive high-quality, optimally contrasted digital images with less radiation generation than conventional generators. Our full suite of digital imaging software offers a variety of image processing abilities. Featuring the latest software processing algorithms, the improved KODAK 8000 System delivers clearer and sharper clinical details. The result: high-diagnostic value images. 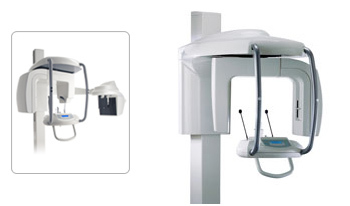 KODAK Dental Imaging Software serves as the control panel for all of our digital imaging systems. Its flexible user interface has been designed specifically for dental radiological diagnosis, and can be used as a standalone program or integrated with your practice management software. Download the free KODAK Acquisition Module for even more abilities. Help patients understand their options through clean, clear images. Our powerful image manipulation tools, including picture management and archiving functions, help improve patient communication. And the software keeps your staff working more efficiently: each user can easily customize his or her own tool bars and each time a specific user logs on, KODAK Dental Imaging Software remembers his or her settings.